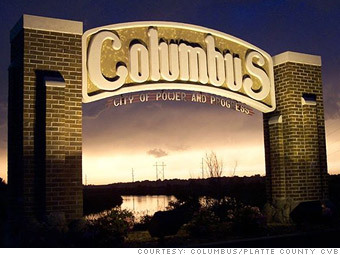 Like many Nebraska towns, Columbus has a low jobless rate. It's the most highly industrialized town per capita in the state; manufacturing alone provides employment to over 5,700 locals. Columbus is home to major agricultural equipment companies and the Nebraska Public Power District. Glur's Tavern, the oldest bar west of the Missouri River, reminds residents of the days when "Buffalo Bill" Cody frequented the area. One drawback: The entertainment of Omaha is nearly two hours away. --D.G. Is Columbus a great town, or what?